A classic recipe of stuffed cabbage leaves served with lamb cutlets. Peel the cabbage and wash the leaves. Set aside 6 large leaves and cut the rest in to thin slices. Bring a large pan of salted water to the boil and cook the 6 leaves for 1 minute. Remove from the pan and immerse in cold water to halt the cooking process. Peel the carrot and the onion and chop in to small dice. Place in a saucepan with the smoked bacons pieces, the garlic and a knob of butter. Cook for 3 minutes then add the chopped cabbage, the water and the chicken stock cube. Cook for 10 minutes. Lay the 6 cabbage leaves out on a clean tea towel or tray. Place a spoonful of the cooked cabbage, carrot and onion on to each leaf. Roll up the leaves to make parcels or balls and place in a baking dish with the rest of the cooking juices. Transfer to the oven and cook for 10 minutes. Heat a frying pan to hot and add a drizzle of olive oil. Cook the lamb cutlets over a high heat for 2 minutes on each side. Lower the heat and add a knob of butter, the breadcrumbs and the spices. Stir to coat all sides of the lamb in breadcrumbs and seasoning. 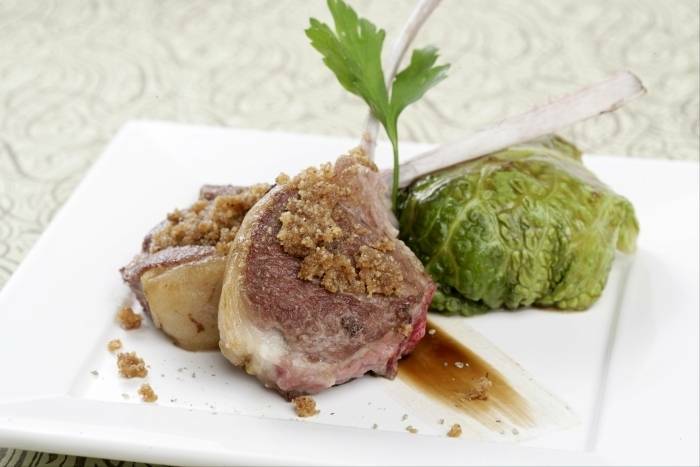 Plate the stuffed cabbage then top with a lamb cutlet. Drizzle over the reduced cooking sauce and finish with a few sprigs of fresh tarragon.